1 tablespoon of toasted sesame oil or standard sesame oil. Mix together the marinade ingredients. Put the fillets in the marinade and leave to marinate for 20-30 minutes. Meanwhile, toast the sesame seeds in a dry frying pan until they are light brown. Cook the rice and beans/peas according to the packet instructions. Now grill the mackerel fillets, skin up for 3 minutes, turn over, and grill for 3 minutes more. Mix the cooked rice with the peas/beans and divide among four bowls. 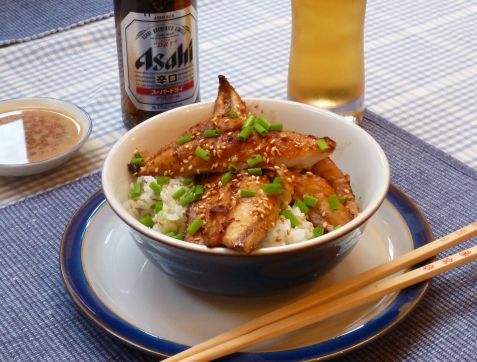 Put the cooked fillets on the rice, and top with the spring onions and a sprinkle of sesame seeds. You can serve with a Japanese dipping sauce. wasabi or more soy sauce.